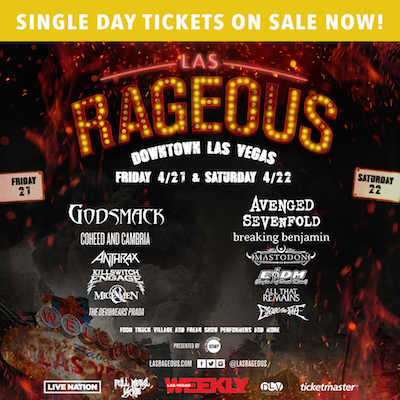 With Sin City's new two-day music festival less than two weeks away, Las Rageous will release single day tickets for the event. Starting at $79.00 (plus fees), single day tickets will be on sale today at 10:00 a.m. PT at www.LasRageous.com. Coming to the heart of downtown Las Vegas on Friday, April 21 and Saturday, April 22, Las Rageous will feature some of the biggest names in hard rock and metal. Friday's lineup features Godsmack, Coheed and Cambria, Anthrax, Killswitch Engage, Of Mice & Men, as well as Las Vegas locals We Gave It Hell and A Friend, A Foe. Saturday's lineup features Avenged Sevenfold, Breaking Benjamin, Mastodon, Eagles of Death Metal, All That Remains, Escape The Fate, as well as Las Vegas locals Nations and Code Red Riot. All ages are welcome and doors open at 4:00 p.m., both days. The festival will also feature a collection of wandering freak show performers and a Vegas scene foodie-focused Food Truck Village.